Rainy weather has led tourism officials to postpone a nationwide public relations campaign promoting Hawaii's sunny skies. State tourism liaison Marsha Wienert said yesterday that up to $100,000 will be spent on "a very aggressive" effort to reassure visitors that "Hawaii is the most beautiful place in the world and is open for business." It has been raining almost continuously in Hawaii since Feb. 19, and tourism officials are trying to counter headlines and TV images of the deadly dam break on Kauai, flooded roads and homes, a shark bite in murky waters off Oahu and a major sewage spill in Waikiki. Wienert said the impact of the bad weather on tourism has been minimal so far, but she expressed concerns about any long-term affects. 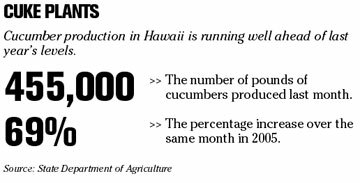 The state announced separately yesterday that the number of visitors to Hawaii in February was 573,412, just 200 more than a year ago. An increase in visitors from the mainland and Canada to Hawaii in February offset a 12.6 percent drop in Japanese visitors. Domestic arrivals in February rose to 415,435, a 2.9 percent jump. Total visitor expenditures increased 5.7 percent over February 2005 to $924.1 million as daily spending rose from $165 to $172. On average, visitors who came in February stayed in Hawaii nine days, a 1.4 percent increase from the same month last year. 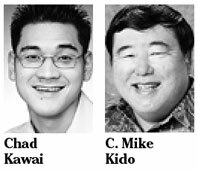 » Hawaiian Host Inc. has promoted Chad Kawai to accounting supervisor. He will be responsible for managing staff and all functions of the accounting department. He previously served as the company's senior accounting clerk. >>The Pacific Resource Partnership has appointed C. Mike Kido to external affairs division head. He will be responsible for developing and implementing legislative strategies and tactical plans in support of the organization's initiatives. He previously served as government affairs manager for the Estate of James Campbell. » HTH Corp. has promoted Toshiya Amada to sales director. He will be responsible for managing sales operations for the wholesale, retail, and the meetings and conventions market at Oahu's Pacific Beach Hotel and Pagoda Hotel and the Big Island's King Kamehameha's Kona Beach Hotel. He joined the company in 1993 as Far East sales manager. » Dixie Grill has appointed Scott D. Mackenzie Ward Avenue general manager. He previously served as general manager of Food Concessions for Scotty's Barbecue Shack. » Goodwill Industries of Hawaii has promoted Rose Shin to workforce development director. She will be responsible for overseeing the planning and implementation of all the company's workforce development programs. She previously served as the company directory of statewide Supporting Employment Empowerment Program. DETROIT » General Motors Corp. warned it may be unable to sell a majority stake in its finance division, in an annual report yesterday that highlighted the myriad risks and financial woes confronting the world's largest automaker. GM has been counting on the sale of a 51 percent stake in General Motors Acceptance Corp. as a way to separate the division's debt rating from GM's own junk rating and raise as much as $15 billion in badly needed cash for the struggling automaker. But GM warned anew yesterday that a deal may not happen. BENTONVILLE, Ark. » Wal-Mart Stores Inc. is increasing surprise inspections at thousands of foreign factories where it buys clothes, toys, shoes and other products as it expands efforts to make sure its suppliers uphold labor and environmental standards. Wal-Mart expects unannounced inspections to make up 30 percent of all inspections this year, up from 20 percent last year and 8 percent in 2004, said Beth Keck, director of international corporate affairs for the world's largest retailer. Wal-Mart critics said the retailer was responding to public pressure and insisted it go further and turn over inspections to outside experts to verify the results. LONG BEACH, Calif. » The U.S. can expect record levels of cargo from Asia this year, but the nation's largest port complex should be able to handle the volume without major disruptions, a panel of shipping industry experts said yesterday. The panel of executives from ocean shipping lines, terminals, trucking firms, railways and labor struck a mostly positive note in presenting its outlook for the peak cargo season from late spring to October. Cargo levels have boomed during the past decade as Asian economies became key manufacturing centers for U.S. companies. West Coast ports and trucking and railway networks have come under increasing strain as they worked to move the cargo. RALEIGH, N.C. » Red Hat Inc. is going through a growth spurt as companies become more comfortable with its software as an alternative to Windows and profits fuel the expansion, executives with the developer of open source software said yesterday. Profitability expanded even as Red Hat grew to more than 1,200 employees. The Raleigh-based company said yesterday its fourth-quarter profit more than doubled to $27.3 million, up from $11.8 million from the same period last year. Earnings per share for the quarter that ended Feb. 28 rose to 13 cents from 6 cents in last year's fourth quarter. Analysts polled by Thomson Financial expected Red Hat to earn 12 cents per share. LAS VEGAS » Sales have been suspended at another luxury condominium project in Las Vegas, as observers said interest had dwindled in properties that were not close to the Strip. Letters were sent to nearly 100 buyers at the Curve project, located in southwest Las Vegas, offering to refund their deposits or extend their contracts by 150 days, vice president Paula James said. At least seven projects have publicly folded or stalled in a little more than a year, a fraction of the more than 100 once proposed. By most accounts, the skyrocketing costs of materials and labor have toppled some high-profile luxury condo projects, turning the market skittish. Paul Murad, author of "Manhattanizing Las Vegas," said the city was not ready for a high-rise project in the suburbs. NEW YORK » Federated Department Stores Inc. plans a two-for-one stock split, its first in 13 years, and is boosting its quarterly dividend. A vote to increase the number of authorized shares from 500 million to 1 billion will be held during the annual meeting on May 19, Cincinnati-based Federated said yesterday. The company will increase the dividend 2 percent to 12.75 cents a share if the split is approved, and 25.5 cents if it isn't. The moves reflect Federated's confidence in its future operating results after its acquisition of May Department Stores Co. for $11 billion last year, Chief Executive Officer Terry Lundgren said. The new cash dividend is payable July 3 to shareholders of record June 16.